A poop egg is essentially the term given to the egg which holds the unbirthed human in a certain circumstance. This is a fairly uncommon circumstance which can be very dangerous to the growing foetus. Usually the mother decides she does not want to go through childbirth, so during the second trimester she may opt to excrete it by means of defecation. This hard encapsulating faecal matter is then referred to as the poop egg. Poop eggs are generally laid in a soft and comfortable bedding acting as a nest, usually in the mother's actual residence. WARNING!! Some people dispute whether poop eggs actually exist due to incomplete and insufficient hospital records and lack of scientific proof. Poop eggs are not able to survive on their own. Proper hatching techniques must be administered. Like many bird eggs, poop eggs need to be sat upon to ensure a warm growing environment. However, the mother is often times far too heavy to sit on the poop egg (because of the exterior walls fragility and ability to easily collapse), so a younger child is used for this purpose. The remaining 3-5 months of growing need to be in a controlled environment under a younger child. The shell of the poop egg may harden or slightly crack during this time. Tiny pores in poop eggshells allow the embryo to breathe. The average poop egg has around 2500 pores. Differences in size and shape. Many people do not opt for poop eggs due to the severe death rates involved. Approximately 35% of all poop eggs do not survive. Another 25% end up having severe birth defects. These include palsy, scoliosis, and others. The child born from a poop egg may exhibit many different traits not like their parents. They usually have a darker pigmentation in their early years and lighten over time. Hair colour is usually a brown or black color with a great thickness and cohesiveness. Introversion often is sustained throughout adolescence and sometimes throughout the person's entire life. The smell of a person birthed from a poop egg stay for upwards of 5 years after hatching. 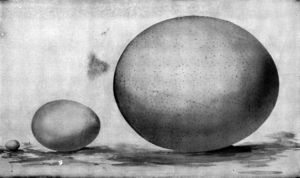 The first poop egg was laid in October 1966 and hatched in February 1967. 77% of those hatched are of the male gender. No other animals other than humans have been birthed from poop eggs. The idea of actually laying a poop egg came from a Greek fairy tale about pregnant mothers sentenced for death. Rumours suggest that Papa Roach has a subliminal message about poop eggs when their songs are played backwards, but there is yet to be any confirmation of this. This page was last edited on 29 August 2007, at 07:41.